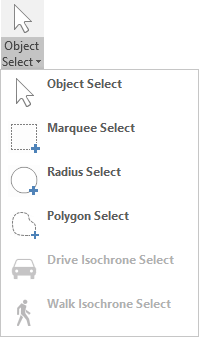 Use the Object Select tool to select a dot on the map or to select data in the Excel sheet to obtain more information. With this tool, there are two options. You can select just one object or a selection can be made of multiple objects. There are two options for selecting objects. You select one (or multiple) dots on the map. If this method is used, the corresponding data will be displayed in the sheet. The other option is to select certain data in the sheet. The corresponding location will be shown on the map.